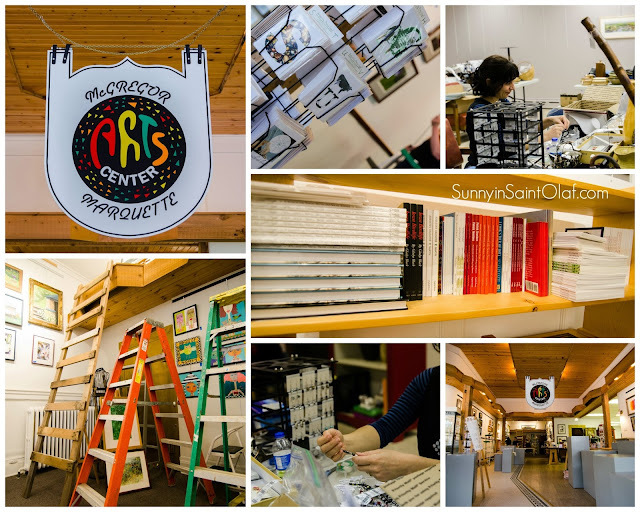 SunnyInSaintOlaf: Behind the Scenes at MMCA! Behind the Scenes at MMCA! This week I was able to sneak into the McGregor-Marquette Center for the Arts for a behind-the-scenes preview before opening night! For the past several weeks, the gallery crew has been busy unpacking boxes, organizing artwork, meeting with local artists, painting pedestals, tagging items and entering inventory for the upcoming 2015 season! You really wouldn't believe all that goes into hanging an exhibit or "simply" organizing a display shelf! Marilyn Etchison, the gallery manager, says she's "excited to see so many new area artists and artworks represented in the Retail Gallery!" I couldn't agree more; I'm excited for my first year as an exhibiting artist in the MMCA Retail Gallery! It's an honor and privilege to show my work in such a beautiful venue alongside so many talented and accomplished artists. the Arts is reason in itself. Inhabiting the grand historic bank building in the heart of McGregor, Iowa, you'll find beauty, culture, and artistic energies abound. 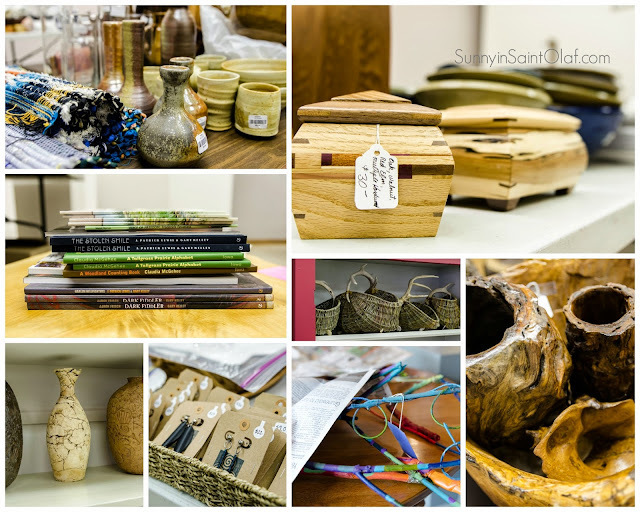 This art space is filled with funky fun sculpture, fine wood-working, handcrafted jewelry, pottery, fiber arts, art greeting cards, Iowan-illustrated books, woven baskets, paintings, photography, and more! The Retail Gallery hosts local fine artists within a 100-mile radius. To view the MMCA website for a detailed list and background info on artists, upcoming shows, and events, click here! This Friday, May 15th, marks the 2015 Grand Opening! The Retail Gallery will be open from 9am-5pm, and there is a special event in the evening at the Special Exhibit Gallery. 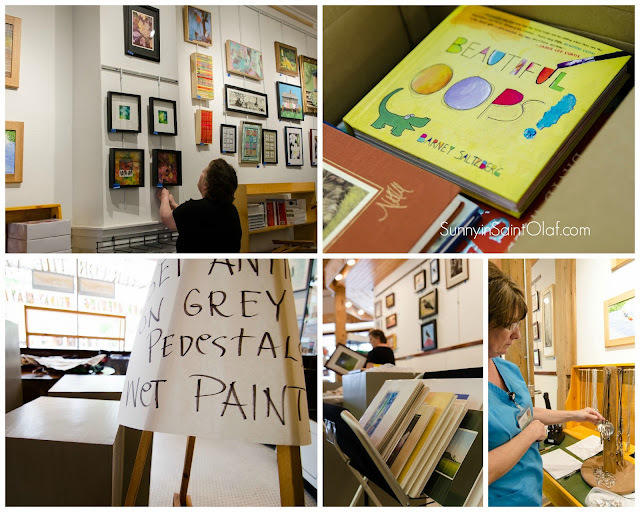 Stop in to mingle, enjoy refreshments, and meet Arthur Geisert, Iowa's own multi-award-winning children's book author! Arthur Geisert's unique and exquisite etchings have been widely praised and exhibited at the Chicago Institute of Art, among other museums. His work is regularly selected for the Society of Illustrators' annual Original Art exhibition, and his illustrations are now being collected by the Dubuque Museum of Art. Friday night you can purchase signed copies of Arthur's Mississippi-based children's book, River Town (I already snagged a copy myself! ), and several of his other works will also be available for purchase. As if meeting the artist wasn't a big enough perk, on Friday night the McGregor-Marquette Center for the Arts will unveil its recent gift and Kickstarter-funded project. "Arthur's Gift," the 22 hand-colored original etchings used to create River Town, were recently gifted to MMCA and archivally matted and framed for display. Opening night will be the first time these etchings have ever been exhibited! You've got to see these large-scale, intricate masterpieces in person. The detail is incredible, the narrative nostalgic, and he will even be present to answer questions and give autographs! Below is just a preview of what's in store for you this Friday!! Stay tuned, I'll be updating you soon with my own review of the Special Exhibit, and my favorite works from the Retail Gallery! In the meantime, don't forget to attend the Grand Opening so you can meet Arthur and have him sign one of his award-winning books of illustrations. I'd like to say a huge "Thank you" to Arthur for sharing his talent with the world, and for his truly generous gift to MMCA and therefore to the public, You rock! Labels: Art, CHECK-it-OUT!, decor, Iowa Art, JillianWebbArt, MMCA, Summer 2015! MAY DAY and MMCA 2015!